1. 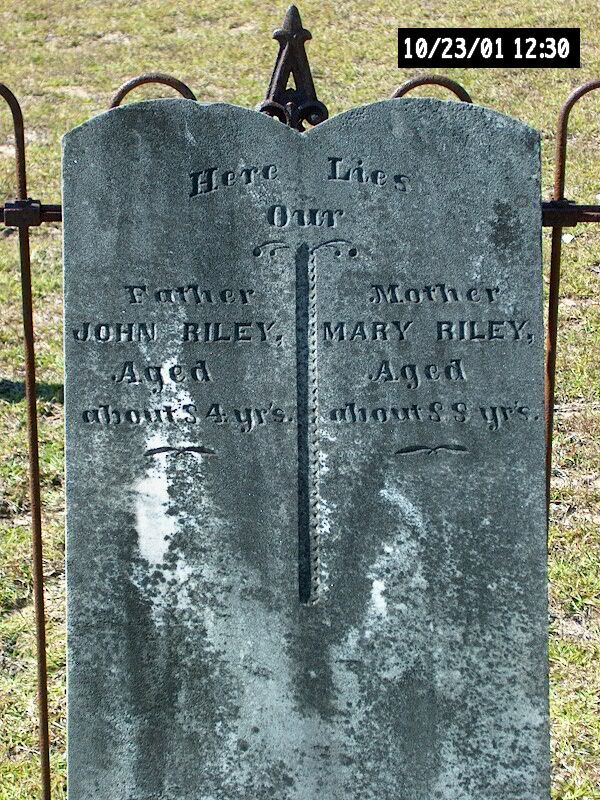 JOANNA 'JODY'6 RILEY (JOHN5, EDWARD4, WILLIAM3, EDWARD2, EDWARD1) was born 18 Nov 1814 in Orange County North Carolina, and died 03 Apr 1890 in Dale County Alabama. She married EDWARD CHRISTOPHER WOODHAM 1844 in Dale County Alabama, son of ARIS WOODHAM and RACHEL RICHARDSON. He was born 1824 in Darlington District, South Carolina, and died 1907 in Lee County Florida. E. C. was not listed with Joanna on the 1880 Census. i. CYNTHIA7 WOODHAM, b. 1845, Dale County Alabama; d. Bet. 1850 - 1860, Dale County Alabama. 2. ii. JOHN WESLEY WOODHAM, b. 18 Jan 1848, Dale County Alabama; d. 08 Oct 1907, Houston County Alabama. 3. iii. MOSES WOODHAM, b. 18 Dec 1847, Dale County Alabama; d. 08 Oct 1907, Houston County Alabama. iv. WILLIAM ARIS WOODHAM, b. Aug 1850, Dale County Alabama; d. 08 Oct 1907, Dothan, Houston County Alabama; m. MARY JANE BEVILL. 4. v. IRA EDWARD WOODHAM, b. 31 Jan 1854, Cherokee County Texas; d. 03 Oct 1938, Iron City, Seminole County Georgia. 5. vi. THOMAS LATRELL WOODHAM, b. 04 Apr 1856, Cherokee County Texas; d. 19 Aug 1891, Dale County Alabama. 6. vii. JOSEPH CHRISTOPHER WOODHAM, SR, b. 27 Oct 1857, Cherokee County Texas; d. 16 Jan 1945, Hineston, Rapides Parish Louisianna. 7. viii. URIAH DANIEL WOODHAM, b. 13 Mar 1861, Dale County Alabama; d. 1910, Walton County Florida. 8. ix. JASPER RICHARD WOODHAM, b. 01 Mar 1863, Dale County Alabama; d. 30 Sep 1936, Dale County Alabama. 9. x. CARRIE ELIZABETH WOODHAM, b. Oct 1865, Dale County Alabama; d. Sep 1925, Geneva County Alabama. 2. JOHN WESLEY7 WOODHAM (JOANNA 'JODY'6 RILEY, JOHN5, EDWARD4, WILLIAM3, EDWARD2, EDWARD1) was born 18 Jan 1848 in Dale County Alabama, and died 08 Oct 1907 in Houston County Alabama. He married ELIZABETH A. RICHARDSON. She was born 1851 in Dale County Alabama. i. MARY A.8 WOODHAM, b. Oct 1868, Dale County Alabama; m. JOHN ALEXANDER PATE; b. 17 Jul 1847, Geneva County Alabama; d. 29 Jul 1924, Holmes County Florida. 10. ii. EDERD EDWARD W. WOODHAM, b. Jan 1871, Dale County Alabama; d. Bet. 1906 - 1910, Holmes County Florida. iii. FRANCES W. WOODHAM, b. 1873, Dale County Alabama. iv. LUCY W. WOODHAM, b. 1878, Dale County Alabama. v. SARAH W. WOODHAM, b. Jun 1880, Dale County Alabama. 3. MOSES7 WOODHAM (JOANNA 'JODY'6 RILEY, JOHN5, EDWARD4, WILLIAM3, EDWARD2, EDWARD1) was born 18 Dec 1847 in Dale County Alabama, and died 08 Oct 1907 in Houston County Alabama. He married ELIZABETH VIRGINIA ANN PEACOCK Abt. 1873 in Dale County Alabama, daughter of FLOURDEAU. She was born May 1853 in Dale County Alabama, and died Mar 1931 in Houston County Alabama. ii. MITTIE C. WOODHAM, b. 1874, Dale County Alabama. 11. iii. CHARLES LAFAYETTE WOODHAM, b. 25 Jun 1876, Dale County Alabama; d. 25 Jun 1944, Houston County Alabama. 12. iv. WILLIAM WASHINGTON WOODHAM, b. 16 Nov 1877, Dale County Alabama; d. 09 Sep 1965, Dothan, Houston County Alabama. 13. v. JESSE LEE GREEN WOODHAM, b. 11 Dec 1878, Dale County Alabama; d. 25 Apr 1921, Houston County Alabama. 14. vi. MARTHA JANE WOODHAM, b. Apr 1880, Dale County Alabama; d. 29 Jan 1962, Dothan, Houston County Alabama. 15. vii. MOLLY WOODHAM, b. Jun 1884, Dale County Alabama. viii. FORD WOODHAM, b. 05 May 1885, Dale County Alabama; d. 12 Nov 1907, Dale County Alabama. ix. THOMAS WOODHAM, b. 26 Apr 1887, Dale County Alabama; d. Jun 1956, Houston County Alabama. 16. x. NOAH WOODHAM, b. 01 Sep 1890, Dale County Alabama; d. 16 Mar 1939, Dothan, Houston County Alabama. xi. JENALLIE 'GENERA' WOODHAM, b. Sep 1891, Dale County Alabama. xii. ETHEL WOODHAM, b. Sep 1893, Dale County Alabama; d. Aug 1932, Dothan, Houston County Alabama. 4. IRA EDWARD7 WOODHAM (JOANNA 'JODY'6 RILEY, JOHN5, EDWARD4, WILLIAM3, EDWARD2, EDWARD1) was born 31 Jan 1854 in Cherokee County Texas, and died 03 Oct 1938 in Iron City, Seminole County Georgia. He married MILDRED ANN ENFINGER Abt. 1877 in Dale County Alabama, daughter of NICKOLAS ENFINGER and MARGARET BEVERETT. She was born 25 Jan 1856 in Jackson County Florida, and died 26 Nov 1934 in Dale County Alabama. i. MARGARET JOANNA8 WOODHAM, b. 23 Mar 1878, Echo, Dale County Alabama; d. 24 Dec 1961, Midland City, Dale County Alabama; m. BRYANT MASON DAUGHTRY RILEY, 19 Apr 1900, Dale County Alabama; b. 11 Aug 1869, Dale County Alabama; d. 30 Jan 1957, Midland City, Dale County Alabama. ii. DILLIE WOODHAM, b. May 1879, Echo, Dale County Alabama. iii. ZILLIE WOODHAM, b. May 1879, Echo, Dale County Alabama. iv. CARRIE IDA WOODHAM, b. 19 Sep 1881, Dale County Alabama; d. 06 Nov 1961, Alabama. 17. v. NORA LEE WOODHAM, b. 23 Sep 1883, Dale County Alabama; d. Albany, Dougherty County Georgia. 18. vi. JOHN WESLEY WOODHAM, b. 01 Sep 1885, Dale County Alabama; d. 30 Nov 1947, Iron City, Seminole County Georgia. vii. ALTO WOODHAM, SR, b. 30 Nov 1887, Dale County Alabama; d. 1936, Lake City Florida; m. ADA B. ANDREWS, 30 Jul 1929, Dothan, Houston County Alabama; b. 17 Apr 1894, Dale County Alabama; d. 23 Jan 1985, Dothan, Houston County Alabama. viii. ANZILLA WOODHAM, b. 17 Dec 1889, Dale County Alabama. 19. ix. LEE WOODHAM, SR, b. 06 Jan 1893, Dale County Alabama; d. 24 Jul 1960, Midland City, Dale County Alabama. 20. x. MOLLIE WOODHAM, b. 29 Mar 1895, Dale County Alabama; d. Feb 1974, Florida. xi. FLORENCE HESTER WOODHAM, b. 06 Aug 1899, Dale County Alabama; d. 06 Mar 1990, Ozark, Dale County Alabama. 21. xii. LONNIE W. WOODHAM, b. 29 Jul 1901, Dale County Alabama; d. 03 Aug 1980, Houston County Alabama. 5. THOMAS LATRELL7 WOODHAM (JOANNA 'JODY'6 RILEY, JOHN5, EDWARD4, WILLIAM3, EDWARD2, EDWARD1) was born 04 Apr 1856 in Cherokee County Texas, and died 19 Aug 1891 in Dale County Alabama. He married NELLIE E. ENFINGER 13 Jul 1873 in Dale County Alabama, daughter of ELLIS ENFINGER and MATILDA TILLER. She was born 01 Aug 1856 in Dale County Alabama, and died 11 Jan 1925 in Dale County Alabama. 22. i. LUCY JANE8 WOODHAM, b. 03 May 1874, Dale County Alabama; d. 21 Dec 1933, Dale County Alabama. 23. ii. SARAH ELIZABETH WOODHAM, b. 17 Feb 1876, Dale County Alabama; d. 01 Jul 1924, Dale County Alabama. 24. iii. WILLIAM ARIS WOODHAM, b. 23 Nov 1876, Dale County Alabama; d. 25 Sep 1954, Dale County Alabama. 25. iv. JOHN FRANKLIN WOODHAM, b. 30 Oct 1879, Dale County Alabama; d. 07 Apr 1964, Dale County Alabama. 26. v. JASPER RICHARD WOODHAM, SR, b. 12 Sep 1881, Dale County Alabama; d. 03 Mar 1946, Dale County Alabama. vi. THOMAS D. WOODHAM, b. 26 Dec 1883, Dale County Alabama; d. 02 Nov 1884, Dale County Alabama. 27. vii. MINNIE WOODHAM, b. 08 Sep 1885, Dale County Alabama. 28. viii. JAMES EDWARD WOODHAM, b. 27 Oct 1887, Dale County Alabama; d. 1945.
ix. LOLETTIE WOODHAM, b. 27 Jan 1889, Dale County Alabama; m. HENRY JACOB PALMER, 26 Jan 1908; b. 08 Feb 1884. 29. x. CAMILLA ESTELL WOODHAM, b. 30 Oct 1890, Dale County Alabama; d. 17 Apr 1963, Dothan, Houston County Alabama. 30. xi. IDELLA WOODHAM, b. 30 Oct 1890, Dale County Alabama. 6. JOSEPH CHRISTOPHER7 WOODHAM, SR (JOANNA 'JODY'6 RILEY, JOHN5, EDWARD4, WILLIAM3, EDWARD2, EDWARD1) was born 27 Oct 1857 in Cherokee County Texas, and died 16 Jan 1945 in Hineston, Rapides Parish Louisianna. He married RHODA MAE ANDREWS Abt. 1876. She was born Oct 1855 in Alabama, and died 20 Dec 1925 in Rapides Parish Louisianna. 31. i. JOHN EDWARD8 WOODHAM, b. 25 Jun 1877, Echo, Dale County Alabama; d. 28 Jan 1954, Hineston, Rapides Parish Louisianna. 32. ii. AMANDA WOODHAM, b. 20 Apr 1880, Echo, Dale County Alabama; d. 15 Nov 1973, Hineston, Rapides Parish Louisianna. iii. MONROE WOODHAM, b. Apr 1886, Dale County Alabama; d. Jun 1902, Rapides Parish Louisianna. 33. iv. ALONZO WOODHAM, b. 25 Oct 1889, Dale County Alabama; d. 01 Jul 1950, Rapides Parish Louisianna. 34. v. BARTO WOODHAM, b. 05 Oct 1892, Dale County Alabama; d. Feb 1982, Rapides Parish Louisianna. vi. JULIA WOODHAM, b. Dec 1893, Dale County Alabama. 7. URIAH DANIEL7 WOODHAM (JOANNA 'JODY'6 RILEY, JOHN5, EDWARD4, WILLIAM3, EDWARD2, EDWARD1) was born 13 Mar 1861 in Dale County Alabama, and died 1910 in Walton County Florida. He married SARAH FRANCES WOODHAM 17 Dec 1881 in Dale County Alabama, daughter of PRESLEY WOODHAM and NANCY ADKINS. She was born 05 Mar 1860 in Dale County Alabama, and died Aft. 1900 in Dale County Alabama. 35. i. ARIS NELSON8 WOODHAM, b. 13 Oct 1884, Dale County Alabama; d. 18 Feb 1951, Columbus, Muscogee County Georgia. ii. ALICE EOLIAN WOODHAM, b. 04 Jul 1887, Dale County Alabama; d. 06 May 1958, Dale County Alabama. iii. NANCY AMANDA H. WOODHAM, b. 08 Feb 1889, Dale County Alabama. iv. BLANTON WOODHAM, b. 12 Feb 1895, Dale County Alabama; d. 12 Feb 1895, Dale County Alabama. v. MITTIE WOODHAM, b. Feb 1897, Dale County Alabama. 8. JASPER RICHARD7 WOODHAM (JOANNA 'JODY'6 RILEY, JOHN5, EDWARD4, WILLIAM3, EDWARD2, EDWARD1) was born 01 Mar 1863 in Dale County Alabama, and died 30 Sep 1936 in Dale County Alabama. He married LAURA FRANCES MAE WOODHAM 29 Feb 1892 in Bainbridge, Decatur County Georgia, daughter of EDWARD WOODHAM and SENIA PAGE. She was born 12 Aug 1868 in Quincy, Gadsden County Florida, and died 24 Apr 1932 in Dale County Alabama. i. PHILLIPS8 WOODHAM, b. Dale County Alabama. ii. LEWIS SHELLY WOODHAM, b. 12 Feb 1893, Ewell, Dale County Alabama; d. 28 Oct 1979, Ozark, Dale County Alabama; m. (1) LAURA PRILLIE MOORE, Dale County Alabama; b. 01 Nov 1897, Dale County Alabama; d. 29 Feb 1940, Dale County Alabama; m. (2) PEARLIE HARRIS, 1942, Dale County Alabama. 36. iii. MATILDA WOODHAM, b. 07 Dec 1895, Dale County Alabama; d. 11 Nov 1974. 37. iv. HATTIE PEARL WOODHAM, b. 03 Mar 1897, Ewell, Dale County Alabama; d. 17 May 1975, Pinckard, Dale County Alabama. 38. v. ANNIE FLOYE WOODHAM, b. 01 Jun 1899, Ewell, Dale County Alabama; d. 09 May 1937, Ozark, Dale County Alabama. 39. vi. JOYCE ANN WOODHAM, b. 27 Apr 1901, Dale County Alabama; d. 26 Jan 1978, Ozark, Dale County Alabama. 40. vii. HOMER ROBERT WOODHAM, b. 01 Jul 1902, Dale County Alabama; d. 06 Nov 1990, Ozark, Dale County Alabama. viii. LAURA MAE WOODHAM, b. 29 Jul 1905, Dale County Alabama; d. 14 Mar 2001, Midland City, Dale County Alabama; m. (1) HILL THOMAS; m. (2) KERMIT D. PHILLIPS, 11 Oct 1947, Dale County Alabama; b. 21 May 1910, Dale County Alabama; d. 27 Jan 1986, Midland City, Dale County Alabama. 41. ix. JEWELL V. WOODHAM, b. Sep 1907, Dale County Alabama; d. 01 Nov 1962, Ozark, Dale County Alabama. x. RAY MOSES WOODHAM, b. 28 Nov 1909, Dale County Alabama; d. 30 Dec 2003, Ozark, Dale County Alabama; m. MELLONA POWERS, 26 Aug 1942.
xi. MINNIE LOU WOODHAM, b. 14 Apr 1912, Dale County Alabama; d. 19 Sep 2011, Midland City, Dale County Alabama; m. TALMADGE SPURGEON BEVERETT; b. 08 Nov 1908, Dale County Alabama; d. 20 Mar 1996, Midland City, Dale County Alabama. 9. CARRIE ELIZABETH7 WOODHAM (JOANNA 'JODY'6 RILEY, JOHN5, EDWARD4, WILLIAM3, EDWARD2, EDWARD1) was born Oct 1865 in Dale County Alabama, and died Sep 1925 in Geneva County Alabama. She married JAMES BENJAMIN ANDREWS 26 Dec 1890 in Dale County Alabama, son of JOHN ANDREWS. He was born 17 Jan 1872 in Dale County Alabama, and died 20 Mar 1914 in Geneva County Alabama. i. WILLIE M.8 ANDREWS, b. Sep 1891, Dale County Alabama; d. 18 Jun 1965, Geneva County Alabama. 42. ii. BERTHA LEE ANDREWS, b. 07 May 1895, Dale County Alabama; d. 22 Dec 1983, Columbus, Muscogee County Georgia. iii. ROBERT HOWARD ANDREWS, b. 25 Mar 1897, Dale County Alabama; d. 29 Dec 1975, Panama City, Bay County Alabama; m. EVA YOUNGBLOOD; b. 25 Jan 1906, Alabama; d. 15 Mar 1990, Panama City, Bay County Alabama. iv. MINNIE B. ANDREWS, b. Aug 1899, Dale County Alabama. v. ANNIE P. ANDREWS, b. 1905, Dale County Alabama. 10. EDERD EDWARD W.8 WOODHAM (JOHN WESLEY7, JOANNA 'JODY'6 RILEY, JOHN5, EDWARD4, WILLIAM3, EDWARD2, EDWARD1) was born Jan 1871 in Dale County Alabama, and died Bet. 1906 - 1910 in Holmes County Florida. He married HATTIE ESTHER COTTON 1890. She was born Oct 1870 in Dale County Alabama, and died 23 Nov 1946 in Birmingham, Jefferson County Alabama. i. DOTTIE M.9 WOODHAM, b. Oct 1892, Dale County Alabama. ii. WILLIAM E. WOODHAM, b. 08 Jan 1897, Dale County Alabama; d. Feb 1981, Birmingham, Jefferson County Alabama. iii. ADOLPH WOODHAM, b. 01 Mar 1901, Holmes County Florida; d. 04 Feb 1979, Noma, Holmes County Florida. 43. iv. JESSE BURLE WOODHAM, b. 05 Dec 1905, Holmes County Florida; d. 07 Jan 1946, Birmingham, Jefferson County Alabama. 11. CHARLES LAFAYETTE8 WOODHAM (MOSES7, JOANNA 'JODY'6 RILEY, JOHN5, EDWARD4, WILLIAM3, EDWARD2, EDWARD1) was born 25 Jun 1876 in Dale County Alabama, and died 25 Jun 1944 in Houston County Alabama. He married JANE ELIZABETH HALL. She was born 17 Jan 1884 in Geneva County Alabama, and died 30 May 1965 in Ashford, Houston County Alabama. i. ETHEL9 WOODHAM, b. 1903, Geneva County Alabama; d. 09 Aug 1932, Houston County Alabama. ii. EWELL WOODHAM, b. 29 Nov 1906, Geneva County Alabama; d. 06 Aug 1947, Houston County Alabama. iii. MAYBELLE WOODHAM, b. Aug 1908, Geneva County Alabama. iv. CHESTER WOODHAM, b. 04 Sep 1911, Geneva County Alabama; d. 25 Jan 1988, Quincy, Gadsden County Florida. v. VERLIN WOODHAM, b. 1915, Geneva County Alabama. vi. GLEN V. WOODHAM, b. 14 Dec 1917, Geneva County Alabama; d. 30 Oct 2004, Missouri. vii. PERRY W. WOODHAM, b. 17 Jun 1919, Geneva County Alabama; d. 19 Oct 2005, Dothan, Houston County Alabama. viii. FOY WOODHAM, b. 23 Jul 1924, Geneva County Alabama; d. 05 Mar 1986, Leon County Florida. 12. WILLIAM WASHINGTON8 WOODHAM (MOSES7, JOANNA 'JODY'6 RILEY, JOHN5, EDWARD4, WILLIAM3, EDWARD2, EDWARD1) was born 16 Nov 1877 in Dale County Alabama, and died 09 Sep 1965 in Dothan, Houston County Alabama. He married (1) MAGGIE. She was born 1894. He married (2) JESSE GERTRUDE MCCRANEY 03 Dec 1905 in Jackson, Verango County Pennyslvania. She was born 28 Sep 1881 in Dale County Alabama, and died 03 Jan 1919 in Houston County Alabama. i. MODEL9 WOODHAM, b. 1927, Houston County Alabama. ii. WILLIE H.9 WOODHAM, b. 05 Sep 1907, Dale County Alabama; d. Oct 1976, Dothan, Houston County Alabama; m. LEONA M.; b. 31 Aug 1908, Alabama; d. 18 Jan 1992, Dothan, Houston County Alabama. iii. HENRY W. WOODHAM, b. 02 Feb 1908, Houston County Alabama; d. 06 Feb 1969, Birmingham, Jefferson County Alabama. 44. iv. FORD JOHN WOODHAM, b. 1909, Houston County Alabama; d. 07 Feb 1969, Barbour County Alabama. v. LILLIE M. WOODHAM, b. 1913, Houston County Alabama; d. 23 Feb 1962, Dothan, Houston County Alabama; m. ALBERT EMANUEL SAUNDERS; b. 04 Dec 1911, Geneva County Alabama; d. 18 Apr 1990, Tallapoosa County Alabama. vi. LIZZIE L. WOODHAM, b. 1914, Houston County Alabama. vii. CHARLES H. WOODHAM, b. 08 Feb 1915, Houston County Alabama; d. 21 Apr 1994, Dothan, Houston County Alabama. 13. JESSE LEE GREEN8 WOODHAM (MOSES7, JOANNA 'JODY'6 RILEY, JOHN5, EDWARD4, WILLIAM3, EDWARD2, EDWARD1) was born 11 Dec 1878 in Dale County Alabama, and died 25 Apr 1921 in Houston County Alabama. He married EXIE ANN JONES, daughter of ALEX JONES. She was born 1883 in Dale County Alabama, and died 18 Mar 1931 in Slocomb, Geneva County Alabama. i. HOSIE9 WOODHAM, b. 1904, Houston County Alabama. ii. BESSIE WOODHAM, b. 1905, Houston County Alabama. 45. iii. LESSIE GERTRUDE WOODHAM, b. 11 May 1906, Houston County Alabama; d. 31 Mar 1987, New Smyrna Beach, Volusia County Florida. iv. CLAUDIE L. WOODHAM, b. 1908, Houston County Alabama. v. RUBIE G. WOODHAM, b. 1912, Houston County Alabama. vi. ROBERT MOSES WOODHAM, b. 21 Apr 1914, Houston County Alabama; d. 26 Feb 1986, Jacksonville, Duval County Florida. vii. JESSE ALEXANDER WOODHAM, b. 19 Apr 1916, Houston County Alabama; d. 06 Jul 1993, Sherrils Ford, Catawba County North Carolina. 14. MARTHA JANE8 WOODHAM (MOSES7, JOANNA 'JODY'6 RILEY, JOHN5, EDWARD4, WILLIAM3, EDWARD2, EDWARD1) was born Apr 1880 in Dale County Alabama, and died 29 Jan 1962 in Dothan, Houston County Alabama. She married RICHARD ALBERT FORTSON, son of WILLIAM FORTSON and JANE CANADY. He was born 21 Oct 1876 in Henry County Alabama, and died 23 Nov 1942 in Dothan, Houston County Alabama. 46. i. EDDIE B.9 FORTSON, b. 13 May 1912, Houston County Alabama; d. 24 Feb 1975, Dothan, Houston County Alabama. ii. ADDIE B. FORTSON, b. 18 May 1916, Houston County Alabama; d. 04 Aug 2005, Dothan, Houston County Alabama; m. R. O. BUNK GILLEY. 15. MOLLY8 WOODHAM (MOSES7, JOANNA 'JODY'6 RILEY, JOHN5, EDWARD4, WILLIAM3, EDWARD2, EDWARD1) was born Jun 1884 in Dale County Alabama. She married W. J. MCDONALD 1909 in Walton County Florida. He was born 1882 in Alabama. Mollie was not living with W. J. McDonald on the 1920 and 1930 Census though she is listed as still married. i. LESLIE9 MCDONALD, b. 1903, Dale County Alabama. ii. SHELLIE U. MCDONALD, b. 1905, Dale County Alabama. iii. HUBERT W. MCDONALD, b. 1907, Dale County Alabama; m. LEVIE; b. 1907, Alabama. iv. RUTH M. MCDONALD, b. Aug 1909, Walton County Florida. v. MABEL MCDONALD, b. 1913, Houston County Alabama. 16. NOAH8 WOODHAM (MOSES7, JOANNA 'JODY'6 RILEY, JOHN5, EDWARD4, WILLIAM3, EDWARD2, EDWARD1) was born 01 Sep 1890 in Dale County Alabama, and died 16 Mar 1939 in Dothan, Houston County Alabama. He married THELMA OTHEL HAYES. She was born 24 Jul 1907 in Houston County Alabama, and died 04 Feb 1983 in Tampa, Hillsborough County Florida. i. MOSES CHARLES9 WOODHAM, b. 16 Sep 1923, Geneva County Alabama; d. 19 Jul 2000, Hagerstown Maryland. ii. D. B. WOODHAM, b. 31 Dec 1925, Geneva County Alabama; d. 13 Nov 1993, Tampa, Hillsborough County Florida. iii. GEORGE W. WOODHAM, b. 06 Oct 1927, Geneva County Alabama; d. 03 Sep 2004, Tampa, Hillsborough County Florida; m. MILDRED. 17. NORA LEE8 WOODHAM (IRA EDWARD7, JOANNA 'JODY'6 RILEY, JOHN5, EDWARD4, WILLIAM3, EDWARD2, EDWARD1) was born 23 Sep 1883 in Dale County Alabama, and died in Albany, Dougherty County Georgia. She married POLLARD O. ALLEN 23 Feb 1903, son of LEE ALLEN and ORRIE D.. He was born 30 Nov 1881 in Dougherty County Georgia, and died 28 May 1939 in Sumter County Georgia. i. EDGAR9 ALLEN, b. 1906, Houston County Alabama. ii. ROBBIE ALLEN, b. 1907, Houston County Alabama. iii. MYRTLE LEE ALLEN, b. 1916, Sumter County Georgia. iv. THELMA ALLEN, b. 1922, Sumter County Georgia. 18. JOHN WESLEY8 WOODHAM (IRA EDWARD7, JOANNA 'JODY'6 RILEY, JOHN5, EDWARD4, WILLIAM3, EDWARD2, EDWARD1) was born 01 Sep 1885 in Dale County Alabama, and died 30 Nov 1947 in Iron City, Seminole County Georgia. He married LILLIE MAE SANDERS 11 May 1913 in Dothan, Houston County Alabama. She was born 17 Sep 1893 in Clopton, Henry County Alabama, and died 22 Jan 1969 in Montezuma, Macon County Georgia. i. BILLY JOE9 WOODHAM, b. 1911, Newville, Henry County Alabama. ii. JOHN HENRY WOODHAM, b. 18 Dec 1913, Newville, Henry County Alabama; d. 17 Apr 1990.
iii. HERBERT WOODHAM, b. 18 Jul 1915, Newville, Henry County Alabama; d. 24 Jun 1985, Seminole County Georgia. 47. iv. LOIS DALE WOODHAM, b. 28 Sep 1917, Newville, Henry County Alabama; d. 06 Jul 2010, Iron City, Seminole County Georgia. 48. v. RUFUS WOODHAM, b. 29 Jan 1920, Newville, Henry County Alabama; d. 18 Sep 1944, Italy, KIA WW II. vi. FLORENCE WOODHAM, b. 1928, Seminole County Georgia; m. JACKSON. 19. LEE8 WOODHAM, SR (IRA EDWARD7, JOANNA 'JODY'6 RILEY, JOHN5, EDWARD4, WILLIAM3, EDWARD2, EDWARD1) was born 06 Jan 1893 in Dale County Alabama, and died 24 Jul 1960 in Midland City, Dale County Alabama. He married SARAH FRANCES SMITH 02 Apr 1910 in Midland City, Dale County Alabama. She was born 12 Jun 1898 in Baker Hill, Barbour County Alabama, and died 24 Feb 1986 in Alabama. i. FLORA GRACE9 WOODHAM, b. 21 Jan 1917, Midland City, Dale County Alabama; d. 18 Jan 1920, Newville, Henry County Alabama. 49. ii. EDWARD J. WOODHAM, b. 11 Mar 1918, Dale County Alabama; d. 04 Oct 1993, Abbeville, Henry County Alabama. iii. LEE WOODHAM, JR, b. 14 Sep 1919, Newville, Henry County Alabama; d. 17 Feb 1945, Phillipines. KIA WW-II. iv. JACK WOODHAM, b. 19 Aug 1923, Newville, Henry County Alabama; m. ANNIE QUINTADELL KIRKLAND, 24 Dec 1946, Dothan, Houston County Alabama; b. 30 May 1930, Dale County Alabama. 50. v. THOMAS LETRELL WOODHAM, b. 11 May 1931, Newville, Henry County Alabama. 20. MOLLIE8 WOODHAM (IRA EDWARD7, JOANNA 'JODY'6 RILEY, JOHN5, EDWARD4, WILLIAM3, EDWARD2, EDWARD1) was born 29 Mar 1895 in Dale County Alabama, and died Feb 1974 in Florida. She married (1) FOY CARR. He was born Sep 1896 in Barbour County Alabama. She married (2) FARMER F. HOOTEN, SR 25 Mar 1910 in Dale County Alabama. He was born 29 Nov 1898 in Dale County Alabama, and died 09 Jul 1978 in Webster, Sumter County Florida. i. ARTHUR JOE9 HOOTEN, b. 1920, Dothan, Houston County Alabama. ii. FARMER F. HOOTEN, JR, b. 1926, Sumter County Florida. 21. LONNIE W.8 WOODHAM (IRA EDWARD7, JOANNA 'JODY'6 RILEY, JOHN5, EDWARD4, WILLIAM3, EDWARD2, EDWARD1) was born 29 Jul 1901 in Dale County Alabama, and died 03 Aug 1980 in Houston County Alabama. He married (1) ETHEL C.. She was born 1906 in Dale County Alabama. He married (2) CLARA INEZ KELLEY 22 Apr 1933. She was born 14 Aug 1907, and died 15 Dec 1986 in Dothan, Houston County Alabama. i. GWENDOLYN9 WOODHAM, b. 1925, Dale County Alabama. ii. EVELYN S. WOODHAM, b. 1926, Dale County Alabama. iii. JAMES H. WOODHAM, b. 1928, Dale County Alabama. 22. LUCY JANE8 WOODHAM (THOMAS LATRELL7, JOANNA 'JODY'6 RILEY, JOHN5, EDWARD4, WILLIAM3, EDWARD2, EDWARD1) was born 03 May 1874 in Dale County Alabama, and died 21 Dec 1933 in Dale County Alabama. She married WILLIAM SIMON SMITH 22 May 1892 in Dale County Alabama, son of WILLIAM SMITH and TELITHA SKETO. He was born 14 Oct 1868 in Dale County Alabama, and died 05 Jun 1942 in Houston County Alabama. 51. i. SHERMAN MCCLELLAND9 SMITH, b. 27 Jul 1893, Dale County Alabama; d. 06 Jul 1962, Dothan, Houston County Alabama. ii. NELLIE SMITH, b. 08 Nov 1894, Dale County Alabama. iii. MITTIE SMITH, b. 27 Feb 1896, Dale County Alabama. iv. VIOLA ISABELL SMITH, b. 29 Jun 1897, Dale County Alabama. v. MINNIE MABELL SMITH, b. 13 Dec 1898, Dale County Alabama. vi. WILLIE DELL SMITH, b. 04 Sep 1900, Dale County Alabama. vii. TERA SMITH, b. 13 Mar 1902, Dale County Alabama. viii. CORA SMITH, b. 19 Jul 1903, Dale County Alabama; d. 02 Feb 1964, Ozark, Dale County Alabama. ix. SPURGEON C. SMITH, b. 03 Jan 1905, Dale County Alabama; d. 15 Mar 1973, Dale County Alabama; m. (1) BLANCHE; b. 1912, Dale County Alabama; m. (2) MYRA NELL. x. NAOMI SMITH, b. 1912, Dale County Alabama. xi. MARY BELLE SMITH, b. 1902, Dale County Alabama. xii. LOTTIE N. SMITH, b. 1914, Dale County Alabama. xiii. J. TALMAGE SMITH, b. Dec 1909, Dale County Alabama; d. Bef. 1920, Dale County Alabama. 23. SARAH ELIZABETH8 WOODHAM (THOMAS LATRELL7, JOANNA 'JODY'6 RILEY, JOHN5, EDWARD4, WILLIAM3, EDWARD2, EDWARD1) was born 17 Feb 1876 in Dale County Alabama, and died 01 Jul 1924 in Dale County Alabama. She married ROBERT EDWARD BULL MARSHALL 08 Aug 1897 in Dale County Alabama, son of FRANCIS MARSHALL and MARY BULL. He was born 20 Mar 1869 in Dale County Alabama, and died 01 Apr 1928 in Midland City, Dale County Alabama. i. INFANT BULL9 MARSHALL, b. 27 May 1897, Dale County Alabama; d. 31 May 1897, Dale County Alabama. 52. ii. SARAH ANN BULL MARSHALL, b. 27 Aug 1899, Dale County Alabama; d. Sep 1981, Dale County Alabama. 53. iii. ALMA BEATRICE BULL MARSHALL, b. 15 Dec 1901, Dale County Alabama; d. 03 Jan 1974, Dale County Alabama. iv. WILLIE ALPHEUS BULL MARSHALL, b. 08 Sep 1903, Dale County Alabama; d. 18 Jul 1923, Dale County Alabama. 54. v. CODY JACKSON BULL MARSHALL, b. 15 Mar 1906, Dale County Alabama; d. 05 Jan 1966, Houston, Harris County Texas. 55. vi. JOHN TEE BULL MARSHALL, b. 12 Dec 1907, Dale County Alabama; d. 15 Mar 1974, Dale County Alabama. 56. vii. RAYMOND EDWARD BULL MARSHALL, b. 15 Aug 1908, Dale County Alabama; d. 22 Oct 1995, Gordon, Houston County Alabama. 57. viii. ALONZO LUNIE RAY BULL MARSHALL, b. 02 Jan 1912, Dale County Alabama; d. 16 Jul 1968, Dale County Alabama. ix. NELLIE MAE BULL MARSHALL, b. 02 Nov 1913, Dale County Alabama; d. 16 Sep 1914, Dale County Alabama. 58. x. ROBERT LEE BULL MARSHALL, b. 02 Oct 1915, Dale County Alabama; d. 26 May 1968, Dothan, Houston County Alabama. 59. xi. JAMES THOMAS BULL MARSHALL, b. 23 Mar 1919, Dale County Alabama; d. 21 Nov 1980, Dale County Alabama. 60. xii. NOAH BULL MARSHALL, b. Abt. 1924, Dale County Alabama; d. 1996, Austin Travis County Texas. 24. WILLIAM ARIS8 WOODHAM (THOMAS LATRELL7, JOANNA 'JODY'6 RILEY, JOHN5, EDWARD4, WILLIAM3, EDWARD2, EDWARD1) was born 23 Nov 1876 in Dale County Alabama, and died 25 Sep 1954 in Dale County Alabama. He married JOSIE J. BEVERETT 17 Jul 1904, daughter of JOHN BEVERETT and SARA NEWTON. She was born 05 Oct 1889 in Dale County Alabama, and died 03 Sep 1984 in Dale County Alabama. i. FLOSSIE9 WOODHAM, b. 13 Jun 1905, Dale County Alabama. ii. DEWEY WOODHAM, b. 16 Mar 1907, Dale County Alabama; d. 10 Apr 1907, Dale County Alabama. iii. FLOWERS WOODHAM, b. 13 Sep 1908, Dale County Alabama; d. Feb 1969, Dothan, Houston County Alabama. iv. GEORGE WOODHAM, b. 1912, Dale County Alabama. v. BENJAMIN WOODHAM, b. 23 Jun 1914, Dale County Alabama; d. 26 Apr 1997, Midland City Dale County Alabama. vi. HELEN WOODHAM, b. Aug 1915, Dale County Alabama. vii. INFANT WOODHAM, b. 25 Jun 1921, Dale County Alabama; d. 10 Jul 1921, Midland City, Dale County Alabama. viii. MIGNONETTE MOLLY WOODHAM, b. 26 Feb 1924, Dale County Alabama; d. 23 Mar 2003, Bryson City, Swain County North Carolina; m. LAMAR BERNARD WILLIAMS, 24 May 1946, Orange County Florida; b. 11 Oct 1917, Yazoo County Mississippi; d. 04 Nov 1975, Sanford, Seminole County Florida. 25. JOHN FRANKLIN8 WOODHAM (THOMAS LATRELL7, JOANNA 'JODY'6 RILEY, JOHN5, EDWARD4, WILLIAM3, EDWARD2, EDWARD1) was born 30 Oct 1879 in Dale County Alabama, and died 07 Apr 1964 in Dale County Alabama. He married WILLIE MAE BULL MARSHALL 08 Jun 1924 in Dale County Alabama, daughter of WILLIAM MARSHALL and LUSETTA PARMER. She was born 15 Sep 1900 in Dale County Alabama, and died 19 Oct 1985 in Dale County Alabama. i. MARY OUIDA9 WOODHAM, b. 02 Mar 1925, Dale County Alabama; d. 23 Mar 2006, Montgomery, Montgomery County Alabama. ii. JAMES OPLE WOODHAM, b. 02 Apr 1927, Dale County Alabama; d. 18 Nov 2007, Slocomb, Geneva County Alabama. iii. MYRA NELL WOODHAM, b. 11 Dec 1928, Dale County Alabama. iv. FRANKLIN DEE WOODHAM, b. 29 Dec 1932, Dale County Alabama; d. 09 Jan 1933, Dale County Alabama. v. ELNA WOODHAM, b. 06 Apr 1935.
vi. THELMA WOODHAM, b. 06 Apr 1935.
vii. VIRGINIA WOODHAM, b. 10 Jul 1938; m. JOHN SPENCER. viii. REX EDWARD WOODHAM, b. 16 Sep 1940.
ix. JONI MAE WOODHAM, b. 11 Mar 1943. 26. JASPER RICHARD8 WOODHAM, SR (THOMAS LATRELL7, JOANNA 'JODY'6 RILEY, JOHN5, EDWARD4, WILLIAM3, EDWARD2, EDWARD1) was born 12 Sep 1881 in Dale County Alabama, and died 03 Mar 1946 in Dale County Alabama. He married (1) ESSIE MYERS. She was born 1889, and died 1914. He married (2) MARY ALICE BULL MARSHALL 05 Dec 1917 in Ozark, Dale County Alabama, daughter of HENRY MARSHALL and SARAH ENFINGER. She was born 03 Jun 1900 in Dale County Alabama, and died 31 Oct 1963 in Dale County Alabama. i. INFANT9 WOODHAM, b. 1911; d. 1912.
ii. INFANT WOODHAM, b. 1913; d. 1914. 61. iii. EDNA FLORENCE9 WOODHAM, b. 22 Sep 1918, Midland City, Dale County Alabama. 62. iv. ROY TALMAGE WOODHAM, b. 25 Aug 1920, Dale County Alabama; d. 02 Aug 1985, Napier Field, Dale County Alabama. 63. v. WANDA WILMA WOODHAM, b. 23 Feb 1923. 64. vi. JASPER RICHARD WOODHAM, JR, b. 18 Feb 1925, Dale County Alabama; d. 23 Jun 1982, Dale County Alabama. vii. JOSEPH EARL WOODHAM, b. 10 Oct 1927, Dale County Alabama; d. 21 Jan 1993, Dothan, Houston County Alabama; m. LOIS CLEARMAN, 03 Jul 1952, Ashford, Houston County Alabama; b. 26 Dec 1925, Houston County Alabama. 65. viii. RICHARD THOMAS WOODHAM, b. 05 Jan 1929, Midland City, Dale County Alabama; d. 04 Apr 2002, Eufaula, Barbour County Alabama. 66. ix. BETTY SUE WOODHAM, b. 19 May 1933, Dale County Alabama. 67. x. NELLIE RUTH WOODHAM, b. 28 Aug 1934, Midland City Cemetery, Dale County Alabama. xi. BILLY CHARLES WOODHAM, b. 19 Feb 1937, Dale County Alabama; d. 25 Jul 1987, Dale County Alabama; m. MARTHA CUNNINGHAM; b. 16 Feb 1955. 27. MINNIE8 WOODHAM (THOMAS LATRELL7, JOANNA 'JODY'6 RILEY, JOHN5, EDWARD4, WILLIAM3, EDWARD2, EDWARD1) was born 08 Sep 1885 in Dale County Alabama. She married GENERAL NOAH PALMER 1903. He was born 1881 in Dale County Alabama. i. JEWELL9 PALMER, b. 1905, Dale County Alabama. ii. DELPHIN PALMER, b. 1907, Houston County Alabama. 28. JAMES EDWARD8 WOODHAM (THOMAS LATRELL7, JOANNA 'JODY'6 RILEY, JOHN5, EDWARD4, WILLIAM3, EDWARD2, EDWARD1) was born 27 Oct 1887 in Dale County Alabama, and died 1945. He married LUCILLE C.. She was born 1897 in Dale County Alabama. i. NELLIE9 WOODHAM, b. 1918, Jackson County Florida. ii. JAMES WOODHAM, b. Dec 1919, Jackson County Florida. iii. HAZEL WOODHAM, b. 1923, Jackson County Florida. iv. DOUGLAS WOODHAM, b. 1925, Jackson County Florida. 29. CAMILLA ESTELL8 WOODHAM (THOMAS LATRELL7, JOANNA 'JODY'6 RILEY, JOHN5, EDWARD4, WILLIAM3, EDWARD2, EDWARD1) was born 30 Oct 1890 in Dale County Alabama, and died 17 Apr 1963 in Dothan, Houston County Alabama. She married WILLIAM JOSEPH BOND, son of JOHN BOND and ELIZABETH WARD. He was born 05 Nov 1887 in Dale County Alabama, and died 09 Nov 1989 in Dothan, Houston County Alabama. i. DEXTER DELMUS9 BOND, b. 16 May 1914, Dale County Alabama; d. 14 Jul 1964, Dothan, Houston County Alabama. ii. JOHN ODELY BOND, b. 25 Jan 1917, Dale County Alabama; d. 15 Feb 2001, Dothan, Houston County Alabama. iii. EDNA EARL BOND, b. 24 Dec 1920, Dale County Alabama; d. 08 Feb 2007, Dothan, Houston County Alabama; m. JAMES PETE THOMLEY; b. 01 Apr 1926, Houston County Alabama; d. 10 Apr 1996, Tuscon, Pima County Arizona. iv. EVELYN BOND, b. 14 Dec 1922, Dale County Alabama; d. 05 Aug 2008, Dothan, Houston County Alabama. v. JOE BOND, b. 13 Nov 1926, Dale County Alabama. 30. IDELLA8 WOODHAM (THOMAS LATRELL7, JOANNA 'JODY'6 RILEY, JOHN5, EDWARD4, WILLIAM3, EDWARD2, EDWARD1) was born 30 Oct 1890 in Dale County Alabama. She married TEE GARNER 22 Apr 1906. 68. i. WOODROW9 GARNER, b. 18 Nov 1912, Dale County Alabama; d. May 1978, Tampa, Hillsborough County Florida. 31. JOHN EDWARD8 WOODHAM (JOSEPH CHRISTOPHER7, JOANNA 'JODY'6 RILEY, JOHN5, EDWARD4, WILLIAM3, EDWARD2, EDWARD1) was born 25 Jun 1877 in Echo, Dale County Alabama, and died 28 Jan 1954 in Hineston, Rapides Parish Louisianna. He married ALICE GREENHAW, daughter of GOLDSBURY G. GREENHAW. She was born 1881 in Rapides Parish Louisianna, and died 23 Sep 1963 in Hineston, Rapides Parish Louisianna. i. AUBREY9 WOODHAM, b. 1905, Rapides Parish Louisianna. ii. JESSE WOODHAM, b. 1907, Rapides Parish Louisianna. iii. THELMA WOODHAM, b. 19 Jul 1909, Rapides Parish Louisianna; d. 12 Feb 1970, Hineston, Rapides Parish Louisianna; m. JAMES FELDER MONK; b. 25 Mar 1908; d. 06 May 1953, Leesville, Vernon Parish Louisianna. iv. IRENE WOODHAM, b. 13 Jun 1911, Rapides Parish Louisianna; d. 16 Feb 1964, Louisianna; m. LUCIUS EVENS GUNTER. v. INEZ WOODHAM, b. 13 Jun 1911, Rapides Parish Louisianna. vi. JANE WOODHAM, b. 1914, Rapides Parish Louisianna. vii. JOHN A. WOODHAM, b. 12 Apr 1915, Rapides Parish Louisianna; d. 30 Jan 1989, Boyce, Rapides Parish Louisianna. viii. JOSEPH WOODHAM, b. 02 Jan 1917, Rapides Parish Louisianna; d. 09 May 1997, Alexandria, Rapides Parish Louisianna. 32. AMANDA8 WOODHAM (JOSEPH CHRISTOPHER7, JOANNA 'JODY'6 RILEY, JOHN5, EDWARD4, WILLIAM3, EDWARD2, EDWARD1) was born 20 Apr 1880 in Echo, Dale County Alabama, and died 15 Nov 1973 in Hineston, Rapides Parish Louisianna. She married JOSEPH LEE WILLIAMS. He was born Jun 1880 in Rapides Parish Louisianna. 69. i. JOSEPH ARTIE9 WILLIAMS, b. 29 Mar 1907, Rapides Parish Louisianna; d. 1957, Rapides Parish Louisianna. 33. ALONZO8 WOODHAM (JOSEPH CHRISTOPHER7, JOANNA 'JODY'6 RILEY, JOHN5, EDWARD4, WILLIAM3, EDWARD2, EDWARD1) was born 25 Oct 1889 in Dale County Alabama, and died 01 Jul 1950 in Rapides Parish Louisianna. He married HATTIE MORRISON 17 Nov 1917 in Vernon County Louisianna. She was born 1896 in Rapides Parish Louisianna. i. JESSE EDWARD9 WOODHAM, b. 19 Aug 1919, Vernon County Louisianna; d. 19 Nov 1942, Vernon County Louisianna. 34. BARTO8 WOODHAM (JOSEPH CHRISTOPHER7, JOANNA 'JODY'6 RILEY, JOHN5, EDWARD4, WILLIAM3, EDWARD2, EDWARD1) was born 05 Oct 1892 in Dale County Alabama, and died Feb 1982 in Rapides Parish Louisianna. He married RUTH V.. She was born 17 Jan 1899 in Rapides Parish Louisianna, and died Dec 1971 in Shreveport, Caddo Parish Louisianna. i. LOLA M.9 WOODHAM, b. Oct 1916, Rapides Parish Louisianna. ii. OWEN WESLEY WOODHAM, b. 10 Aug 1918, Rapides Parish Louisianna; d. 09 Mar 2002, Hineston, Rapides Parish Louisianna. iii. HOMER WOODHAM, b. 29 Mar 1922, Rapides Parish Louisianna; d. 17 Jan 2008, Rapides Parish Louisianna. 35. ARIS NELSON8 WOODHAM (URIAH DANIEL7, JOANNA 'JODY'6 RILEY, JOHN5, EDWARD4, WILLIAM3, EDWARD2, EDWARD1) was born 13 Oct 1884 in Dale County Alabama, and died 18 Feb 1951 in Columbus, Muscogee County Georgia. He married FLORA T. WINDHAM 30 Sep 1906 in Dale County Alabama, daughter of JOE WINDHAM and TIPPIE. She was born 24 Oct 1893 in Dale County Alabama, and died 09 Aug 1973 in Columbus, Muscogee County Georgia. i. ERIE D.9 WOODHAM, b. 25 Jul 1907, Dale County Alabama. ii. LOTTIE L. WOODHAM, b. Jul 1909, Dale County Alabama. 36. MATILDA8 WOODHAM (JASPER RICHARD7, JOANNA 'JODY'6 RILEY, JOHN5, EDWARD4, WILLIAM3, EDWARD2, EDWARD1) was born 07 Dec 1895 in Dale County Alabama, and died 11 Nov 1974. She married PILLIE OUTHER WOODHAM 25 Feb 1917, son of PERTHENA EDMONIA M. WOODHAM. He was born 09 Aug 1887 in Dale County Alabama, and died 28 Sep 1948 in Midland City, Dale County Alabama. 70. i. PAULINE MARGARUITE9 WOODHAM, b. 30 Jan 1918, Dale County Alabama; d. 12 Sep 2005, Midland City Dale County Alabama. ii. RUTH N. WOODHAM, b. 25 Mar 1921, Dale County Alabama; d. 25 Sep 2010, Midland City, Dale County Alabama; m. JOHN MIRIAM MEARS; b. 20 Nov 1920, Dale County Alabama; d. 27 Oct 2008, Birmingham, Jefferson County Alabama. iii. MILDRED L. WOODHAM, b. 1922, Dale County Alabama. iv. JACQUELINE WOODHAM, b. 21 May 1926, Dale County Alabama; d. 04 Sep 1989, Bradenton, Manatee County Florida; m. BENNETT. v. PILLY O. WOODHAM, b. 03 Jun 1927, Dale County Alabama; d. 27 May 1996, Alabama. vi. EVELYN R. WOODHAM, b. May 1929, Dale County Alabama. 37. HATTIE PEARL8 WOODHAM (JASPER RICHARD7, JOANNA 'JODY'6 RILEY, JOHN5, EDWARD4, WILLIAM3, EDWARD2, EDWARD1) was born 03 Mar 1897 in Ewell, Dale County Alabama, and died 17 May 1975 in Pinckard, Dale County Alabama. She married ESPY ELMER PILCHER, SR, son of SWINIE PILCHER and MOLLIE. He was born 27 Jul 1896 in Dale County Alabama, and died 11 May 1971 in Pinckard, Dale County Alabama. i. ESPY ELMER9 PILCHER, JR, b. 01 Dec 1921, Pinckard, Dale County Alabama; d. 11 Oct 1985, Dothan, Houston County Alabama; m. EDDIE RUTH S.; b. 31 Jan 1920.
ii. GLADYS L. PILCHER, b. 1924, Pinckard, Dale County Alabama. 71. iii. SANDRA ANN PILCHER, b. 05 Sep 1939, Pinkard, Dale County Alabama. 38. ANNIE FLOYE8 WOODHAM (JASPER RICHARD7, JOANNA 'JODY'6 RILEY, JOHN5, EDWARD4, WILLIAM3, EDWARD2, EDWARD1) was born 01 Jun 1899 in Ewell, Dale County Alabama, and died 09 May 1937 in Ozark, Dale County Alabama. She married GORDON BARNEY SKIPPER 14 Sep 1924 in Dale County Alabama, son of ROBERT SKIPPER and NANNY BLACKMON. He was born 17 Sep 1900 in Dale County Alabama, and died 13 Apr 1968 in Ozark, Dale County Alabama. i. JAMES9 SKIPPER, b. 1925, Dale County Alabama. ii. PAUL SKIPPER, b. 1929, Dale County Alabama. iii. ANNIE L. SKIPPER, b. 04 May 1932, Dale County Alabama; d. 22 Mar 2000, Graceville, Jackson County Florida. 39. JOYCE ANN8 WOODHAM (JASPER RICHARD7, JOANNA 'JODY'6 RILEY, JOHN5, EDWARD4, WILLIAM3, EDWARD2, EDWARD1) was born 27 Apr 1901 in Dale County Alabama, and died 26 Jan 1978 in Ozark, Dale County Alabama. She married JAMES TULLY PARAMORE, SR. He was born 1900 in Dale County Alabama, and died Mar 1977 in Ozark, Dale County Alabama. i. JAMES TULLY9 PARAMORE, JR, b. 30 May 1922, Dale County Alabama; d. 27 Mar 1962, Ozark, Dale County Alabama; m. ELEANOR. ii. COLEMAN A. PARAMORE, b. 21 Nov 1926, Dale County Alabama; d. 28 Jun 2003, Auburn, King County Washington. 72. iii. ROBERT NOEL PARAMORE, b. 15 Feb 1932, Dale County Alabama. 40. HOMER ROBERT8 WOODHAM (JASPER RICHARD7, JOANNA 'JODY'6 RILEY, JOHN5, EDWARD4, WILLIAM3, EDWARD2, EDWARD1) was born 01 Jul 1902 in Dale County Alabama, and died 06 Nov 1990 in Ozark, Dale County Alabama. He married MALLIE JEWEL SKIPPER 15 Dec 1923. She was born 16 Jan 1897 in Dale County Alabama, and died 20 Jan 1982 in Ozark, Dale County Alabama. i. MAXELINE9 WOODHAM, b. Jan 1927, Dale County Alabama. ii. IMOGENE WOODHAM, b. Jan 1928, Dale County Alabama. iii. HOMER WOODHAM, b. Mar 1930, Dale County Alabama. 41. JEWELL V.8 WOODHAM (JASPER RICHARD7, JOANNA 'JODY'6 RILEY, JOHN5, EDWARD4, WILLIAM3, EDWARD2, EDWARD1) was born Sep 1907 in Dale County Alabama, and died 01 Nov 1962 in Ozark, Dale County Alabama. She married WILLIAM JEPTHA BALDWIN, son of GEORGE BALDWIN and LENORA WOODHAM. He was born 27 Jul 1895 in Dale County Alabama, and died 09 Aug 1970 in Ozark, Dale County Alabama. i. VIRGINIA9 BALDWIN, b. 30 Apr 1926, Dale County Alabama; d. 06 Jul 2001, Anniston, Calhoun County Alabama. 42. BERTHA LEE8 ANDREWS (CARRIE ELIZABETH7 WOODHAM, JOANNA 'JODY'6 RILEY, JOHN5, EDWARD4, WILLIAM3, EDWARD2, EDWARD1) was born 07 May 1895 in Dale County Alabama, and died 22 Dec 1983 in Columbus, Muscogee County Georgia. She married WILLIAM HENRY PETERS 1910 in Dale County Alabama. He was born 15 Feb 1883 in Alabama, and died Jan 1936 in Geneva County Alabama. i. LORENA9 PETERS, b. 08 Jul 1911, Geneva County Alabama; d. 30 Jul 1911, Geneva County Alabama. ii. INFANT PETERS, b. 05 Nov 1912, Geneva County Alabama; d. 06 Nov 1912, Geneva County Alabama. 73. iii. EUNICE L. PETERS, b. 13 Jun 1915, Geneva County Alabama; d. 09 Sep 2009, Ashford, Houston County Alabama. iv. RUBY J. PETERS, b. Feb 1917, Geneva County Alabama. v. INFANT PETERS, b. 01 Aug 1919, Geneva County Alabama; d. 18 Sep 1919, Geneva County Alabama. vi. HENRY B. PETERS, b. 16 Nov 1920, Geneva County Alabama; d. 05 Aug 2001, Columbus, Muscogee County Georgia. vii. NELLIE MAE PETERS, b. 1924, Geneva County Alabama. viii. WILLIAM F. PETERS, b. 26 Dec 1926, Geneva County Alabama; d. 28 Mar 2003, Phenix City, Russell County Alabama. ix. CAREY EDNA PETERS, b. Aug 1929, Geneva County Alabama. 43. JESSE BURLE9 WOODHAM (EDERD EDWARD W.8, JOHN WESLEY7, JOANNA 'JODY'6 RILEY, JOHN5, EDWARD4, WILLIAM3, EDWARD2, EDWARD1) was born 05 Dec 1905 in Holmes County Florida, and died 07 Jan 1946 in Birmingham, Jefferson County Alabama. He married EDNA BUTLER. She was born 1907 in Alabama. i. PAUL ELLIOT.10 WOODHAM, b. 21 Jul 1928, Birmingham, Jefferson County Alabama; d. 16 Nov 1997, Edwardsville, Wyandotte County Kansas. 44. FORD JOHN9 WOODHAM (WILLIAM WASHINGTON8, MOSES7, JOANNA 'JODY'6 RILEY, JOHN5, EDWARD4, WILLIAM3, EDWARD2, EDWARD1) was born 1909 in Houston County Alabama, and died 07 Feb 1969 in Barbour County Alabama. He married QUILLIE BEATRICE AGNES THAMES. She was born 07 Aug 1911 in Houston County Alabama, and died Oct 1995 in Dothan, Houston County Alabama. i. FRANCES M.10 WOODHAM, b. Apr 1930, Geneva County Alabama. 45. LESSIE GERTRUDE9 WOODHAM (JESSE LEE GREEN8, MOSES7, JOANNA 'JODY'6 RILEY, JOHN5, EDWARD4, WILLIAM3, EDWARD2, EDWARD1) was born 11 May 1906 in Houston County Alabama, and died 31 Mar 1987 in New Smyrna Beach, Volusia County Florida. She married RALPH V. PHILLIPS. He was born 28 May 1905 in Volusia County Florida, and died 31 Mar 1987 in New Smyrna Beach, Volusia County Florida. i. H. WENDALL10 PHILLIPS, b. 10 Feb 1932, Volusia County Florida. 46. EDDIE B.9 FORTSON (MARTHA JANE8 WOODHAM, MOSES7, JOANNA 'JODY'6 RILEY, JOHN5, EDWARD4, WILLIAM3, EDWARD2, EDWARD1) was born 13 May 1912 in Houston County Alabama, and died 24 Feb 1975 in Dothan, Houston County Alabama. He married GLADYS. i. RHONDA10 FORTSON, m. LAMAR APLIN. ii. IRIS FORTSON, m. FREDDY WILLIFORD. iii. BRUCE FORTSON, m. SHARON. iv. R. E. RONNY FORTSON. 47. LOIS DALE9 WOODHAM (JOHN WESLEY8, IRA EDWARD7, JOANNA 'JODY'6 RILEY, JOHN5, EDWARD4, WILLIAM3, EDWARD2, EDWARD1) was born 28 Sep 1917 in Newville, Henry County Alabama, and died 06 Jul 2010 in Iron City, Seminole County Georgia. She married WILLIAM EMORY CROSS 22 Oct 1938 in Donalsonville, Seminole County Georgia. He was born 19 Aug 1913 in Seminole County Georgia, and died 22 Jan 1987 in Dothan, Houston County Alabama. i. KATHRYN PATRICIA10 CROSS, m. LOGUE. 74. ii. CHARLES EDWARD CROSS, SR.
48. RUFUS9 WOODHAM (JOHN WESLEY8, IRA EDWARD7, JOANNA 'JODY'6 RILEY, JOHN5, EDWARD4, WILLIAM3, EDWARD2, EDWARD1) was born 29 Jan 1920 in Newville, Henry County Alabama, and died 18 Sep 1944 in Italy, KIA WW II. He married NORMA TURNAGE 05 Nov 1938 in Donalsonville, Seminole County Georgia. She was born 04 Apr 1921 in Reynoldsville, Seminole County Georgia, and died 08 Aug 1994 in Columbus, Muscogee County Georgia. 75. i. ROBERT EARL10 WOODHAM, b. 24 Sep 1939, Iron City, Seminole County Georgia; d. 02 Aug 2009, Columbus, Muscogee County Georgia. 49. EDWARD J.9 WOODHAM (LEE8, IRA EDWARD7, JOANNA 'JODY'6 RILEY, JOHN5, EDWARD4, WILLIAM3, EDWARD2, EDWARD1) was born 11 Mar 1918 in Dale County Alabama, and died 04 Oct 1993 in Abbeville, Henry County Alabama. He married (1) PEARL WHITEHEAD. She was born 1920 in Alabama. He married (2) VANARA TEW 21 Oct 1939 in Headland, Henry County Alabama. She was born 03 Oct 1923 in Barbour County Alabama, and died 21 Jun 1976 in Dale County Alabama. 50. THOMAS LETRELL9 WOODHAM (LEE8, IRA EDWARD7, JOANNA 'JODY'6 RILEY, JOHN5, EDWARD4, WILLIAM3, EDWARD2, EDWARD1) was born 11 May 1931 in Newville, Henry County Alabama. He married (1) HAZEL MARIE JACKSON 27 Jan 1949. She was born 1930 in Jackson County Florida, and died 24 Apr 1971 in Columbus, Muscogee County Georgia. He married (2) BETTY JO DALTON 03 Sep 1971 in Dothan, Houston County Alabama. She was born 03 Mar 1936 in Tazewell Tennessee. He married (3) CLAUDIA MAONE HOLLIDGE 23 May 1974 in Houston County Alabama. She was born 14 Jul 1941 in Indianapolis Indiana. 51. SHERMAN MCCLELLAND9 SMITH (LUCY JANE8 WOODHAM, THOMAS LATRELL7, JOANNA 'JODY'6 RILEY, JOHN5, EDWARD4, WILLIAM3, EDWARD2, EDWARD1) was born 27 Jul 1893 in Dale County Alabama, and died 06 Jul 1962 in Dothan, Houston County Alabama. He married MAMIE EVERETT, daughter of JOHN EVERETT and SCINNIE WINDHAM. She was born 1896 in Dale County Alabama, and died 18 Nov 1971 in Ozark, Dale County Alabama. i. HAWATHA10 SMITH, b. 1917, Dale County Alabama. ii. L. J. SMITH, b. 11 Jun 1918, Dale County Alabama; d. 13 Jan 1991, Alabama. iii. GEORGE W. SMITH, b. 22 Feb 1920, Dale County Alabama; d. 19 Jan 1996, Daleville, Dale County Alabama. iv. SHERMAN SHERLEY SMITH, b. 1922, Dale County Alabama; d. 11 Feb 1970, Dothan, Houston County Alabama. v. JOHN S. SMITH, b. 30 May 1924, Dale County Alabama; d. 04 Jun 2004, Graceville, Jackson County Florida. vi. COLLIS W. SMITH, b. 06 Apr 1927, Dale County Alabama; d. 20 Dec 1991, Tennessee. vii. LIVING, b. 1929, Dale County Alabama. 52. SARAH ANN BULL9 MARSHALL (SARAH ELIZABETH8 WOODHAM, THOMAS LATRELL7, JOANNA 'JODY'6 RILEY, JOHN5, EDWARD4, WILLIAM3, EDWARD2, EDWARD1) was born 27 Aug 1899 in Dale County Alabama, and died Sep 1981 in Dale County Alabama. She married LUNIE E. ENFINGER 23 Dec 1921 in Dale County Alabama, son of ERVIN ENFINGER and EXA. He was born 21 Dec 1902 in Dale County Alabama, and died 21 Mar 1942 in Dale County Alabama. i. COLLIE10 ENFINGER, b. 26 Nov 1922, Dale County Alabama; d. Aug 1982, Midland City Dale County Alabama, HH 331, age 27; m. JONSIE. 78. ii. LIVING, b. 04 Oct 1926, Dale County Alabama. iii. LETTIE ANN ENFINGER, b. 09 Jun 1934, Dale County Alabama; d. 16 Oct 1956, Dale County Alabama. 79. iv. GERALD ENFINGER, b. 04 Apr 1938, Dale County Alabama. 53. ALMA BEATRICE BULL9 MARSHALL (SARAH ELIZABETH8 WOODHAM, THOMAS LATRELL7, JOANNA 'JODY'6 RILEY, JOHN5, EDWARD4, WILLIAM3, EDWARD2, EDWARD1) was born 15 Dec 1901 in Dale County Alabama, and died 03 Jan 1974 in Dale County Alabama. She married STEPHEN JUSTICE WALDEN, SR 06 Feb 1921 in Dale County Alabama. He was born 12 Apr 1890 in Dale County Alabama, and died 14 Aug 1974 in Dale County Alabama. 81. ii. STEPHEN JUSTICE WALDEN, JR, b. Dale County Alabama. 82. iii. ALMA RUTH WALDEN, b. 09 Jan 1921, Midland City, Dale County Alabama; d. 20 Feb 2011, Columbus, Muscogee County Georgia. 83. iv. SARAH ELIZABETH WALDEN, b. 04 Mar 1924, Dale County Alabama; d. 07 Jun 1977, Dale County Alabama. v. DOROTHY MAE WALDEN, b. 11 Jun 1926, Dale County Alabama; d. 19 Oct 1927, Dale County Alabama. 84. vi. TERA LOIS WALDEN, b. 01 Jun 1928, Dale County Alabama; d. 27 Mar 2001, Birmingham, Jefferson County Alabama. vii. INFANT WALDEN, b. 06 Dec 1931, Dale County Alabama; d. 06 Dec 1931, Dale County Alabama. 85. viii. PEGGY JO WALDEN, b. 25 Jun 1934, Dale County Alabama; d. 09 Apr 1998, Dale County Alabama. 54. CODY JACKSON BULL9 MARSHALL (SARAH ELIZABETH8 WOODHAM, THOMAS LATRELL7, JOANNA 'JODY'6 RILEY, JOHN5, EDWARD4, WILLIAM3, EDWARD2, EDWARD1) was born 15 Mar 1906 in Dale County Alabama, and died 05 Jan 1966 in Houston, Harris County Texas. He married PAULINE MARGARUITE WOODHAM 22 Dec 1933 in Panama City, Bay County Florida, daughter of PILLIE WOODHAM and MATILDA WOODHAM. She was born 30 Jan 1918 in Dale County Alabama, and died 12 Sep 2005 in Midland City Dale County Alabama. 55. JOHN TEE BULL9 MARSHALL (SARAH ELIZABETH8 WOODHAM, THOMAS LATRELL7, JOANNA 'JODY'6 RILEY, JOHN5, EDWARD4, WILLIAM3, EDWARD2, EDWARD1) was born 12 Dec 1907 in Dale County Alabama, and died 15 Mar 1974 in Dale County Alabama. He married CORA LEE SMITH 11 Aug 1928 in Pinckard, Dale County Alabama, daughter of CHARLEY SMITH and MAUDE HALSTEAD. She was born 11 Sep 1912 in Dale County Alabama, and died 20 Mar 1998 in Dale County Alabama. 56. RAYMOND EDWARD BULL9 MARSHALL (SARAH ELIZABETH8 WOODHAM, THOMAS LATRELL7, JOANNA 'JODY'6 RILEY, JOHN5, EDWARD4, WILLIAM3, EDWARD2, EDWARD1) was born 15 Aug 1908 in Dale County Alabama, and died 22 Oct 1995 in Gordon, Houston County Alabama. He married DORA LEE JENKINS 04 Sep 1929 in Dale County Alabama, daughter of OSCAR JENKINS and KELLY HAWKINS. She was born 23 Aug 1910 in Dale County Alabama, and died 29 Aug 2000 in Gordon, Houston County Alabama. 93. i. BILLY MACK10 MARSHALL, SR, b. 15 Nov 1930. 94. ii. WILLIE ALPHAS MARSHALL, b. 23 Oct 1932. 95. iii. CHARLES EDWIN MARSHALL, b. 12 Dec 1934. 96. iv. REBECCA MARSHALL, b. 10 Apr 1939. 97. v. JOSEPH EARL MARSHALL, b. 21 Dec 1940, Gordon, Houston County Alabama. 98. vi. ED COMER MARSHALL, b. 18 Aug 1936. 57. ALONZO LUNIE RAY BULL9 MARSHALL (SARAH ELIZABETH8 WOODHAM, THOMAS LATRELL7, JOANNA 'JODY'6 RILEY, JOHN5, EDWARD4, WILLIAM3, EDWARD2, EDWARD1) was born 02 Jan 1912 in Dale County Alabama, and died 16 Jul 1968 in Dale County Alabama. He married RHODA INEZ SKETO, daughter of CHRISTOPHER SKETO and FLOY RILEY. She was born 09 Oct 1917 in Dale County Alabama, and died 14 Jan 1995 in Dale County Alabama. x. WILLIAM FRANKLIN MARSHALL, b. 27 Jun 1952, Dale County Alabama; d. 06 Nov 1994, Dale County Alabama; m. JENNETTE. 58. ROBERT LEE BULL9 MARSHALL (SARAH ELIZABETH8 WOODHAM, THOMAS LATRELL7, JOANNA 'JODY'6 RILEY, JOHN5, EDWARD4, WILLIAM3, EDWARD2, EDWARD1) was born 02 Oct 1915 in Dale County Alabama, and died 26 May 1968 in Dothan, Houston County Alabama. He married CLYDE LUCILLE JOHNSON. She was born 13 May 1921. 59. JAMES THOMAS BULL9 MARSHALL (SARAH ELIZABETH8 WOODHAM, THOMAS LATRELL7, JOANNA 'JODY'6 RILEY, JOHN5, EDWARD4, WILLIAM3, EDWARD2, EDWARD1) was born 23 Mar 1919 in Dale County Alabama, and died 21 Nov 1980 in Dale County Alabama. He married EUNICE. i. VERN10 KLINGER, m. CHERI EDWARDS. ii. A. CHESTER KLINGER, b. 21 Jul 1943; d. 09 Oct 1979.